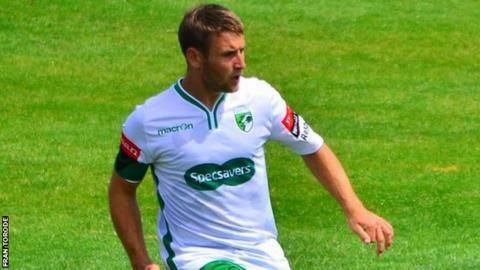 Former Guernsey FC captain Sam Cochrane has retired from the island side. The 31-year-old, who led the Green Lions from their foundation in 2011, stepped down as captain last season. Cochrane, whose last appearance came in the 2-0 loss at Whyteleafe in September, led the club to the FA Vase semi-finals in 2013 and two promotions. His retirement coincided with Guernsey's first away win of the season as they beat Faversham Town 2-1 thanks to an own goal and a Craig Young goal. "My playing days with Guernsey FC are now at an end," Cochrane, who was the first player to sign for Guernsey FC when they were formed, posted on Facebook. "Clear understanding to all my friends on here also who know how big a part of my life this football club has been for the last seven years is important. "I would still like a role within the club at some point but this type of decision is one only the board of directors can make." Cochrane missed the first half of last season because of injury and felt that he could no longer maintain the commitment needed for the Isthmian League Division One South club. "I won't be living off my past, I'm not that type of person," he continued. "I sit back proud with a weight of huge responsibility off my shoulders to not have to keep delivering a loyal and committed service to my team-mates from a playing perspective that I can no longer maintain."